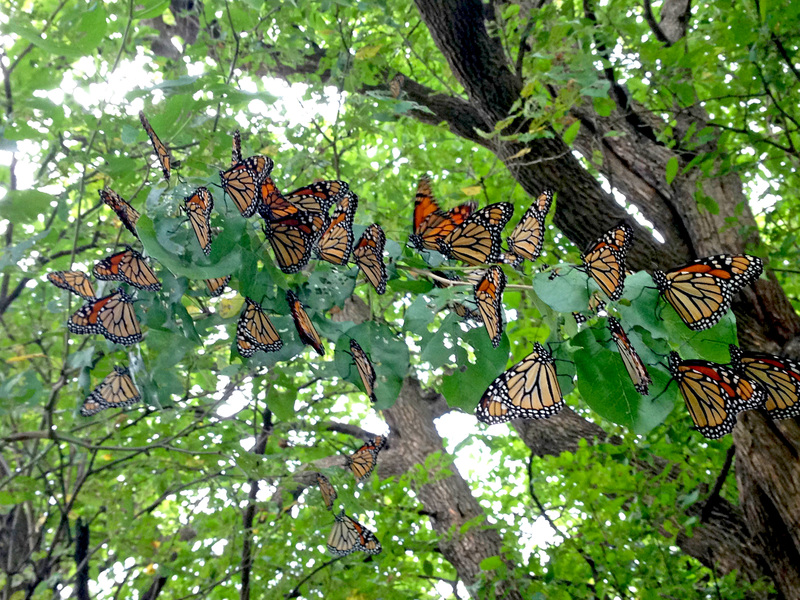 Last week (late September) the Monarchs began to congregate in the arboretum. There are hundreds of them hanging from the branches in the hedgerow of our amphitheater. They are pooling here until the next north wind can help push them south. In the last few years, we have only seen a handful in the arboretum during their annual migration. When I first started working here many years ago, they would cover the trees, turning them orange and black. We have certainly seen the decline of the population since then, but I am hoping the Monarchs hanging from the trees today signal a turn-around of the decrease encountered since the 1990s. It is a wonderful and exciting sight to see so many of them. I could spend hours watching the Monarchs. They are mesmerizing, thought-provoking and captivating all at the same time. Here are three reason why they intrigue me so much. 1. They are delicate but strong. How can something so beautiful and fragile make the nearly 2000 mile journey from Canada to central-Mexico? Every autumn, millions of monarch butterflies survive this incredible journey. From start to finish it takes them two months to make the trip. These delicate monarch butterflies are a marvel of nature. We admire their beauty and endurance. If you really think about it, the migration is one the most amazing in the natural world. 2. They love milkweeds and find them in the landscape. I have heard that Monarchs can smell milkweeds from over two miles away. 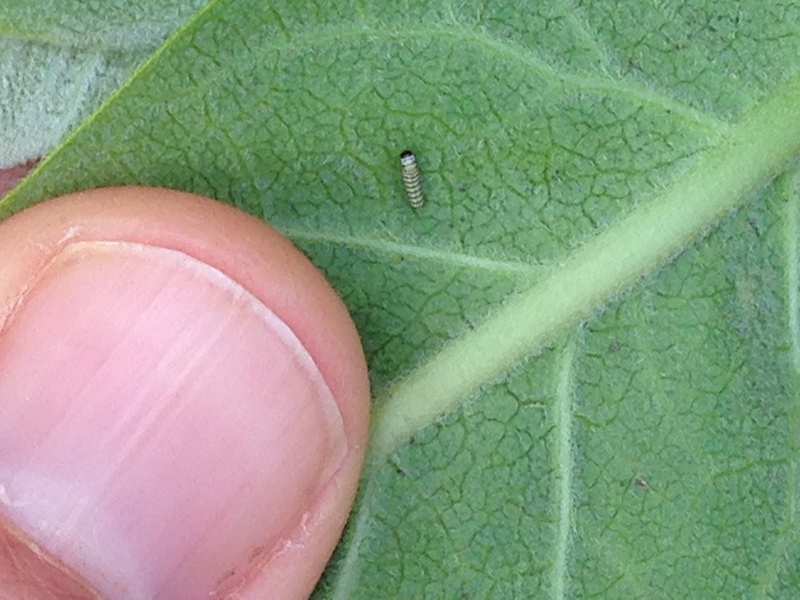 It may be from even further away if the milkweed population is large. Wow, do they have good senses, but their survival depends on them finding milkweeds. Monarchs use receptors on their antennae to “smell” the milkweeds in your landscape. As they get closer to the plants, sight takes over to land on the actual plant. They make the final assessment of the plants with receptors on their feet. 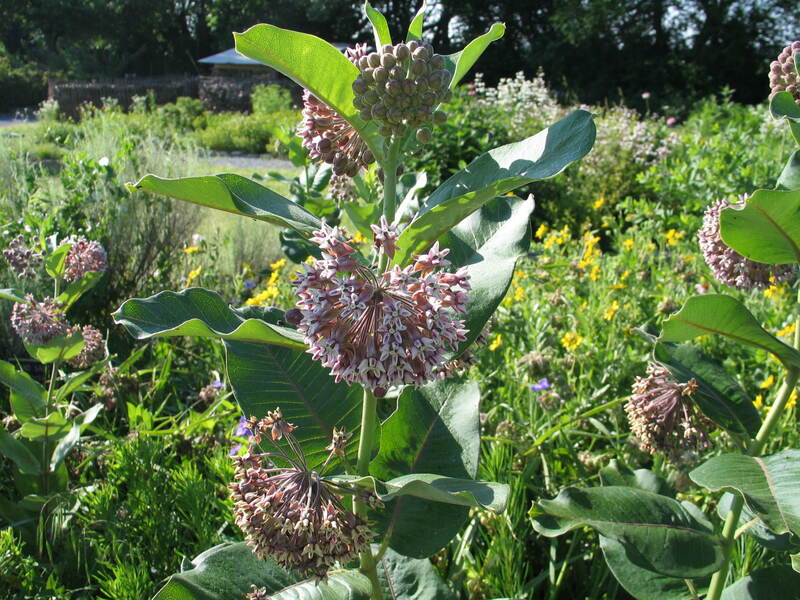 So more milkweeds in your landscape will only increase the odds of attracting Monarchs to your garden. 3. They use the winds to aid their migration. As they have been resting and waiting at the arboretum this week, the Monarchs have been feasting on the wildflowers in bloom such as asters, goldenrods, and sunflowers. I anticipate their departure as soon as the next north wind comes sweeping down the plains. They use the updrafts called “thermals” and prevailing winds to their advantage, much like migrating birds, to preserve energy. Their flapping wings can propel them southward at speeds ranging between 10 to 25 miles an hour. Monarchs can travel 50-100 miles per day to complete the two months journey. There will be time to rest when they finally make it to the warm Central Mexican Oyamel fir forests in the Michoacan hills. The annual Monarch migration is a magical event. These winged wonders captivate my/our attention every year. How can something so small go so far? It is truly extraordinary how they flutter all the way south. They are worth saving. 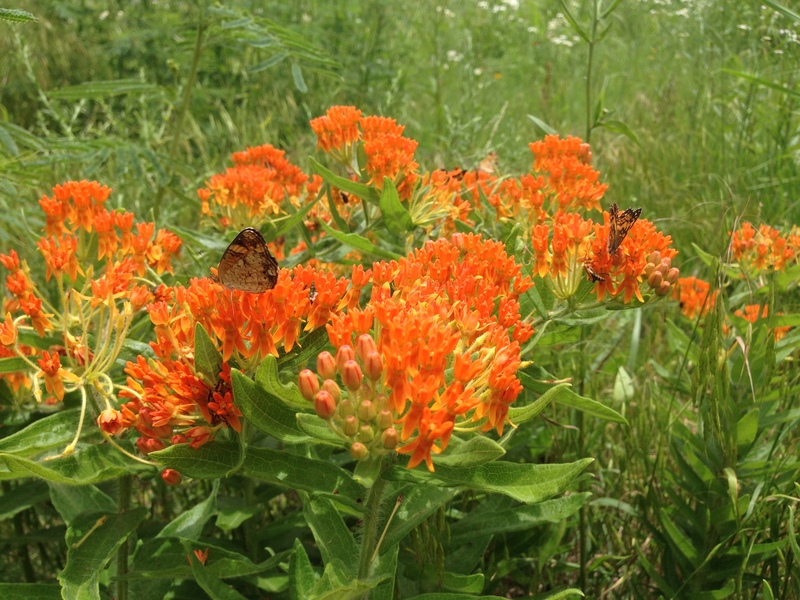 Join me in planting milkweeds and establishing the habitat sanctuaries they need. We can all be part of the solution. Mention fall blooms to most gardeners and they think of chrysanthemums. Blooming in September and October, “mums” are the major source of color in most late-season gardens. Another group of fall-bloomers that are just as attractive, but not as well-known, are the asters. Asters are related to chrysanthemums (both are in the Sunflower Family) and have similar daisy-like flowers. Like chrysanthemums, asters also come in a wide variety of sizes and colors and are perennial, meaning they come up year-after-year. 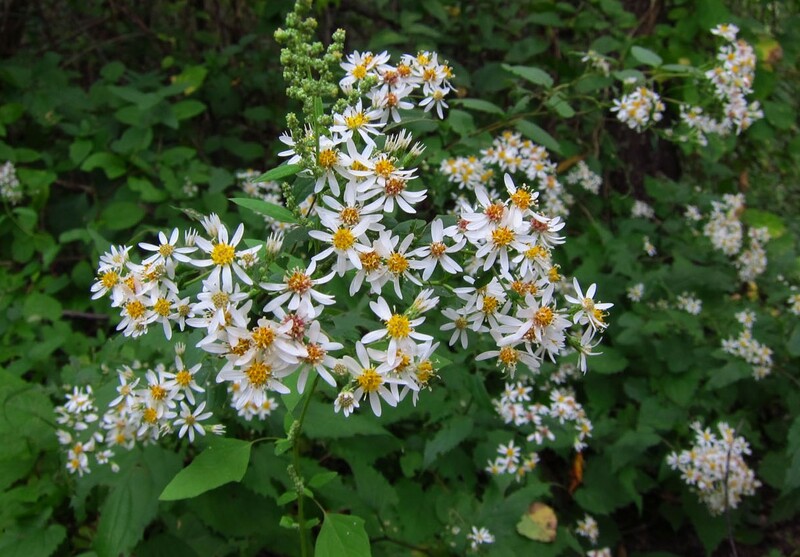 There are several native asters in the collections of the Dyck Arboretum and these are discussed below. The New England aster (Aster novae-angliae) occurs in eastern Kansas. One of the taller species, this plant may reach three to four feet in height. The flowers are generally a shade of purple in color, although pink and white-flowered forms have been found. ‘Purple Dome’, ‘Hella Lacy’, ‘Alma Potschke’ and ‘Vibrant Dome’ are good varieties for the garden. The sky blue aster (previously Aster azureus, now Aster oolentaniensis) grow two to three feet tall and has a bright blue flower. Also occurring in eastern Kansas, this species in particularly useful as a garden plant because it can tolerate dry shade. ‘Bluebird’ is a nice selection. The aromatic aster (Aster oblongifolius) grows further west than the previous species, and is a more drought-tolerant plant. 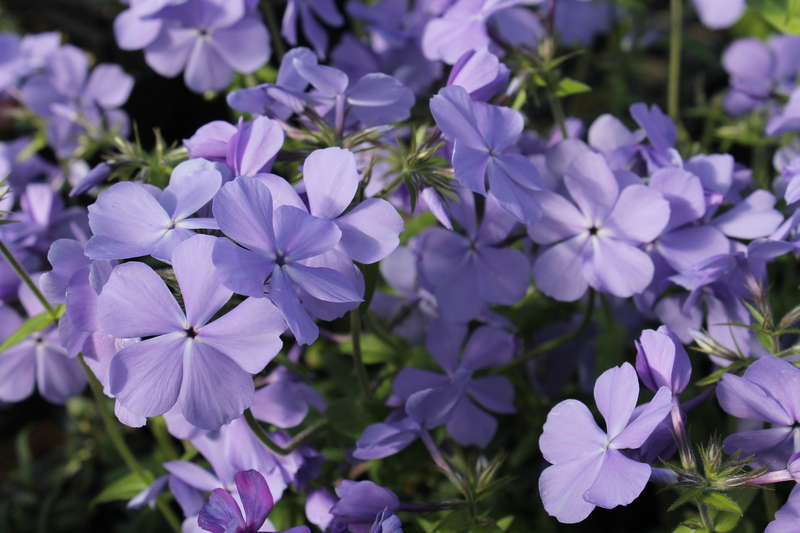 Its name alludes to its fragrant purple flowers and pungent foliage when bruised. This species grows about two foot tall. We have ‘Dream of Beauty’ (short with pink blooms), ‘October Skies’ (2’ x 2’ with light blue flowers) and ‘Raydon’s Favorite’ (3’ x 2’ with light blue flowers). The heath aster (Aster ericoides) has the smallest flowers of any in the group, but it produces them in large enough numbers to make an impressive show. In the late summer, it is covered with tiny white daisies. Typically, it grows to two feet tall. 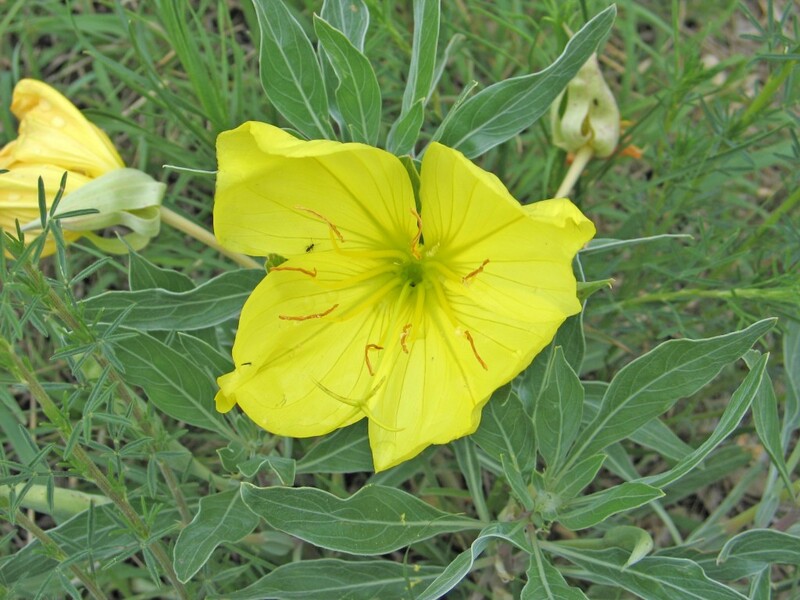 This adaptable plant occurs throughout much of Kansas. ‘Snow Flurry’ is a groundcover form only reaching 6-8 inches tall. 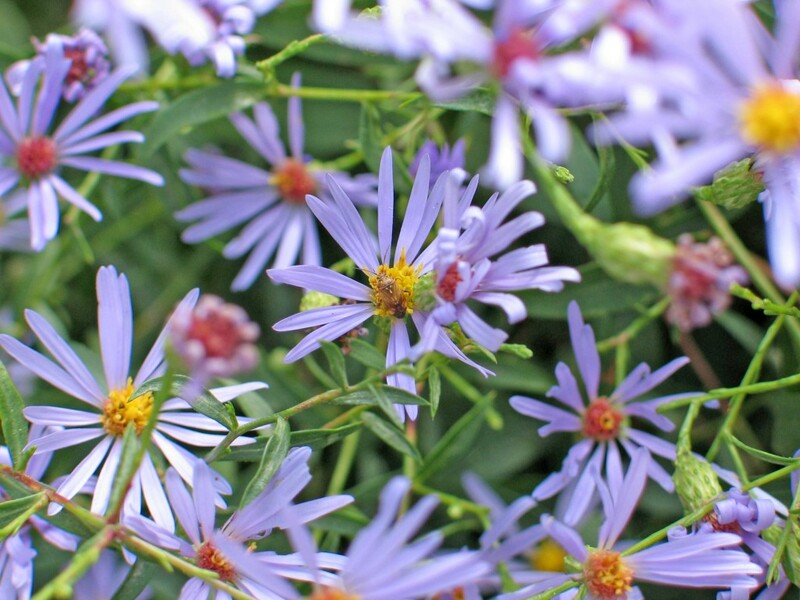 Fendler’s aster (Aster fendleri) is the smallest of all the Kansas asters, only reaching about eight inches in height. Occurring in central and western Kansas on dry, rocky prairie, it is probably the most drought-tolerant of our native asters. In September these low plants are literally covered with lavender daisies. The variety ‘My Antonia’ would make a nice addition to a xeric garden. A few varieties for shade would be White Woodland Aster (Aster divaricatus ‘Eastern Star’) which makes a great groundcover with white blooms and mahogany stems. It only reaches 12 inches tall. The other woodland aster is Blue Wood Aster (Aster cordifolius) which is taller (3’ X 3’) with loads of tiny light blue flowers. 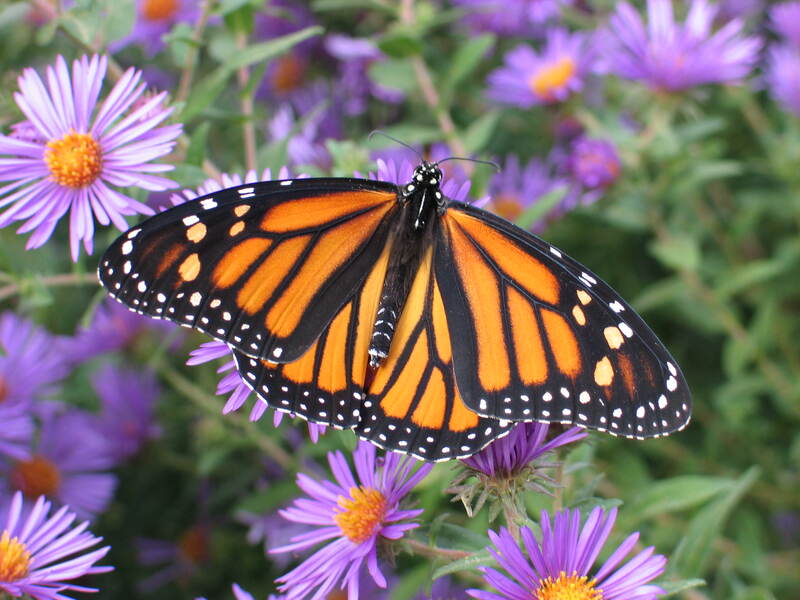 In addition to being appreciated by humans, many asters also attract many different pollinators including Monarchs. Planting asters is a good way to bring these beautiful creatures into the home garden. 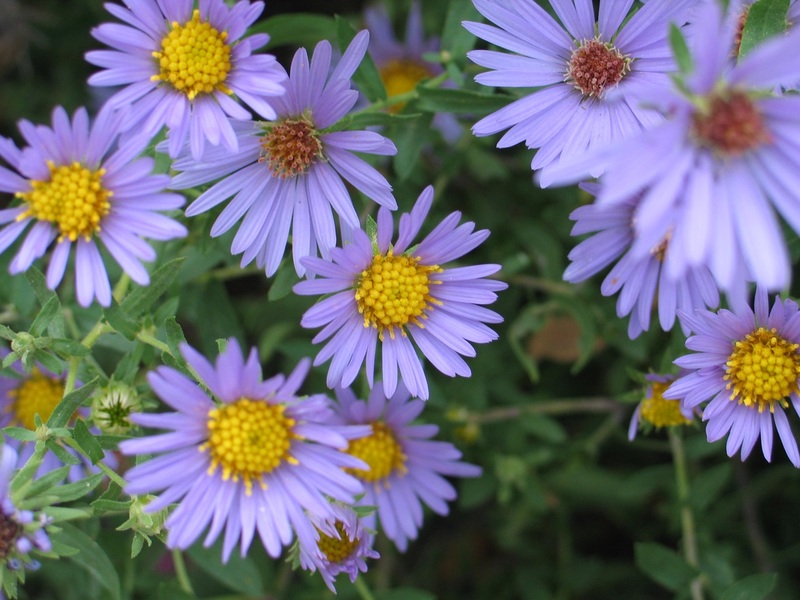 Of the asters described above, only New England aster is widely available for purchase. We carry many of these asters at our FloraKansas plant sales. The others can be obtained from mail-order nurseries that specialize in wildflowers. These native wildflowers are good examples of plants that are not only beautiful and useful, but also hardy and adapted to our climate and growing conditions. In my opinion, you should give them a try. It is so common around this part of the country that we take it for granted, but the Osage Orange (Maclura pomifera) is a very special tree, valuable to both farmer and wildlife, and integral to the agricultural history of Kansas. 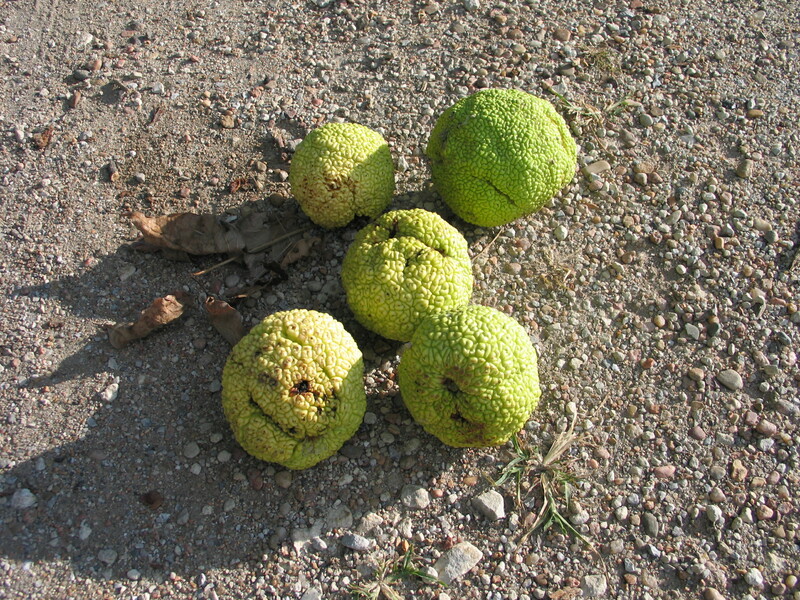 Osage Orange, of course, is the tough, thorny tree of Central Kansas hedgerows. To many people, it’s also known as hedgeapple, or simply hedge. It grows so well here, even escaping out into fields and wood lots, it seems that it must have been here before the pioneers arrived. Actually, Osage Orange did not occur naturally in Kansas: its original range was limited to parts of Texas, Oklahoma, Arkansas and Louisiana until it was brought in for windbreaks and living fences in the 1880s. At that time, many miles of hedge were constructed by planting thousands of young Osage Orange trees closely together in a line. Many hedgerows still can be seen dividing fields and pastures today. Once established, the thorny young trees were pruned to promote thick, bushy growth. 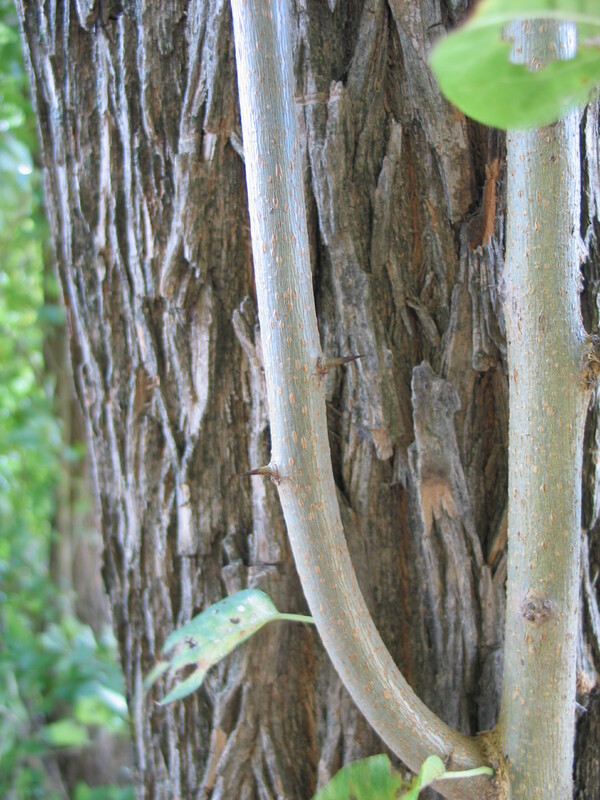 The term “Horse high, bull strong and hog tight”, used to describe the Osage Orange, simply means that the hedge rows were pruned so that they were tall enough that a horse would not jump it, stout enough that a bull would not push through it and woven so tightly that even a hog could not find its way through. Hedge is tough! When barbed wire was invented, the hedge fences were torn down or left to grow on their own as shelterbelts, field borders and windbreaks. Along with its attributes as a hedge, Osage Orange has long been valued for the strength and durability of its wood. Ironically, barbed wire is usually tied to a hedge post to make pasture fences. The Osage Indians, from which the tree’s name is derived, were noted for using the wood to make bows. It is reported that Osage Orange bows were so highly regarded by Indian tribes to the north that they were willing to offer a horse and blanket in trade for one. Anyone who has ever been around the trees in the fall is familiar with their “oranges” (or “apples”). These softball size fruit are produced on the “female” trees, while “male” trees have only pollen producing flowers and do not bear fruit. Available Osage Orange (Maclura pomifera) cultivars include ‘Wichita’ and ‘Whiteshield’ (vase-shaped). Use fruitless and thornless cultivars only. This common tree is often overlooked, but is a valuable and iconic component of our Kansas landscape. 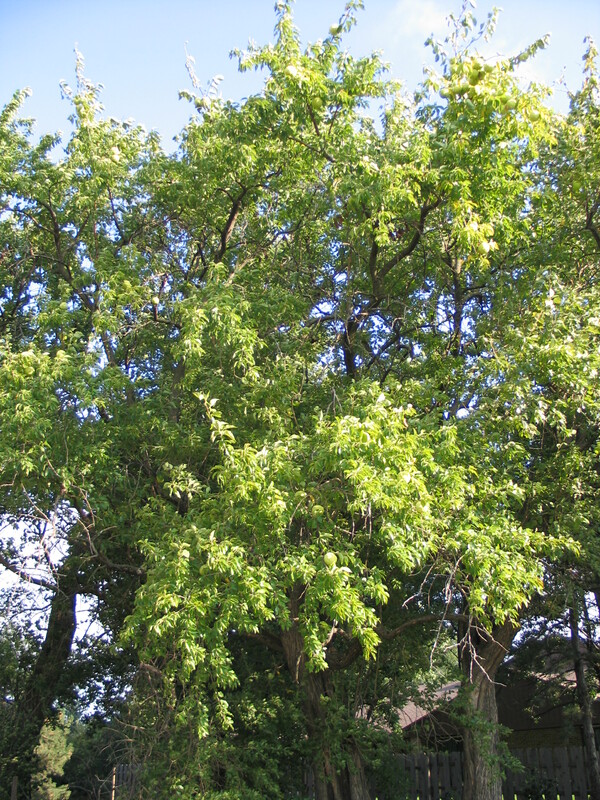 The resilient Osage Orange holds the soil well, and provides cover for wildlife and a windbreak against strong winds. Though it may not function as a fence for modern farmers, its presence here reminds us of the ingenuity and tenacity of our farming ancestors on the Great Plains. One of the most important components of our mission is connecting people with the prairie. We try to accomplish this in a number of ways, such as through educational programs, plant sales, tours and the Earth Partnership for Schools program. There is a feeling of value, necessity, stewardship and even urgency to establishing a native plant wildlife garden. 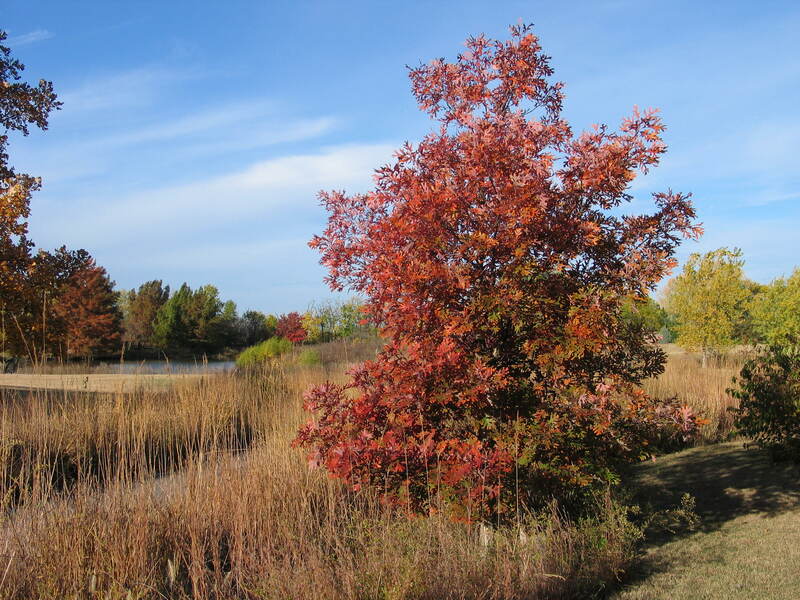 The arboretum is a model of this type of landscaping using prairie plants. It is our hope that visitors and members desire to learn more about the prairie ecosystem and/or see our displays and decide to follow our example by starting a prairie garden of their own. 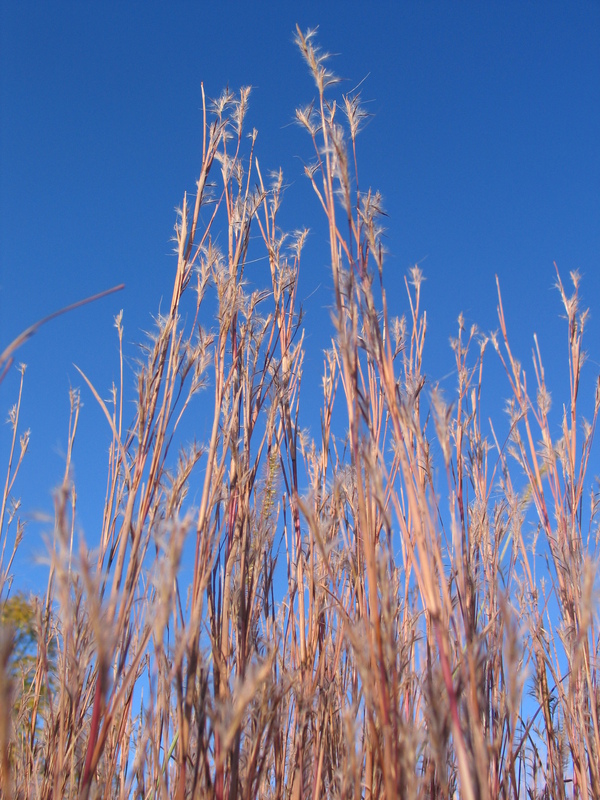 One place to begin is to try a few native plants from our FloraKansas fall plant sale. You can start by transitioning the land surrounding your home to native plants. Believe it or not, even a small garden can make a difference. You will be amazed what happens by adding just a few wildflowers to your landscape. It will be a prairie oasis of beautiful plants that will provide habitat to a variety of pollinators and other wildlife. 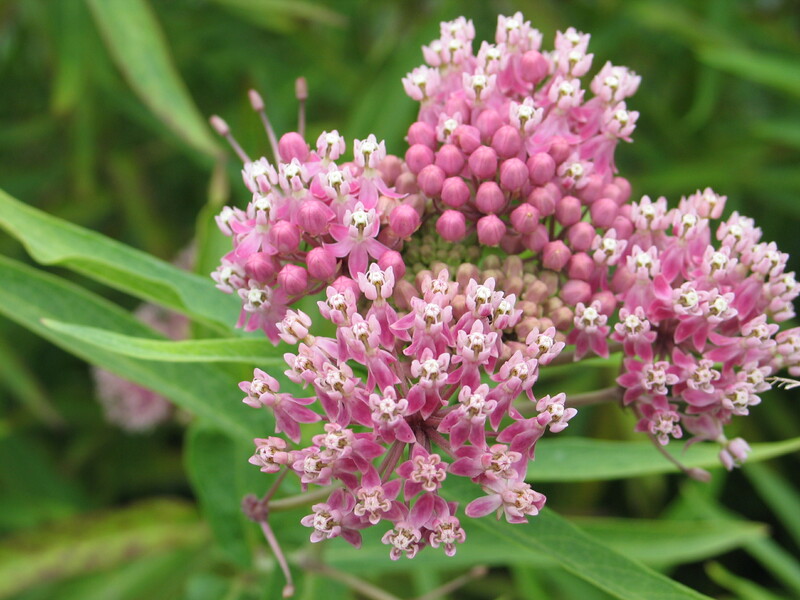 Help the Monarchs by planting one of these milkweeds available at the sale. Plant a tree this fall. Here are the trees available at the sale. Do you have shade? Choose from some of these shade-loving perennials. Does your landscape attract garden friendly wildlife? Do you implement good land management practices such as using less water, spreading less fertilizer, applying little or no insecticides? Utilizing wildflowers and grasses from the prairie in your landscape will foster a sustainable future for us and the world around us. Be part of the conservation movement. Imagine your native prairie garden combined with other native landscapes in our area providing food and habitat for a host of wildlife. It will make a difference. Late summer to early fall is the best time to establish perennial wildflowers, grasses, and shrubs. With cooler, wetter fall and spring seasons to begin to establish deep, long-lived root systems, plantings at this time of the year have the greatest chance of survival. Our Dyck Arboretum members understand this reality well and are strong attendees at our September plant sale. 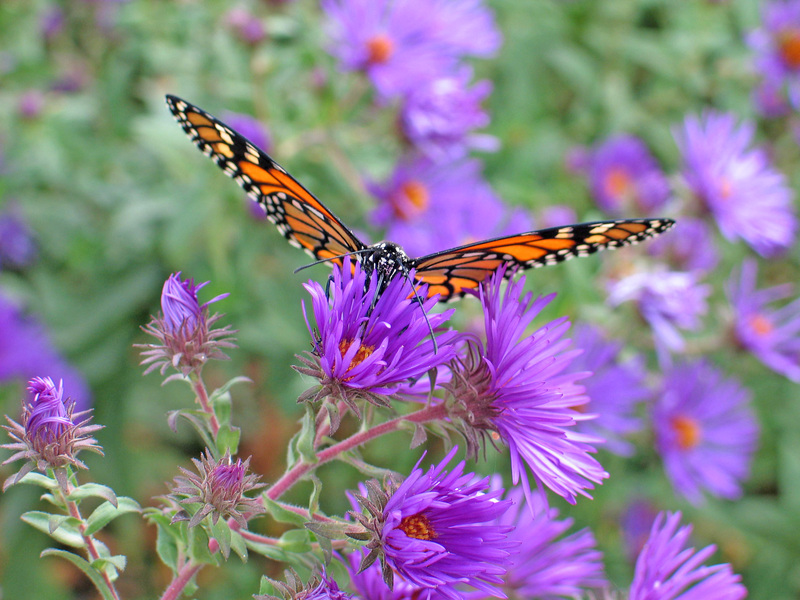 Asters typically bloom during the peak of the fall monarch butterfly migration. Full sun, average soil – thriving in at least six hours of sunlight and with soils possessing moderate amounts of silt, clay and moisture. 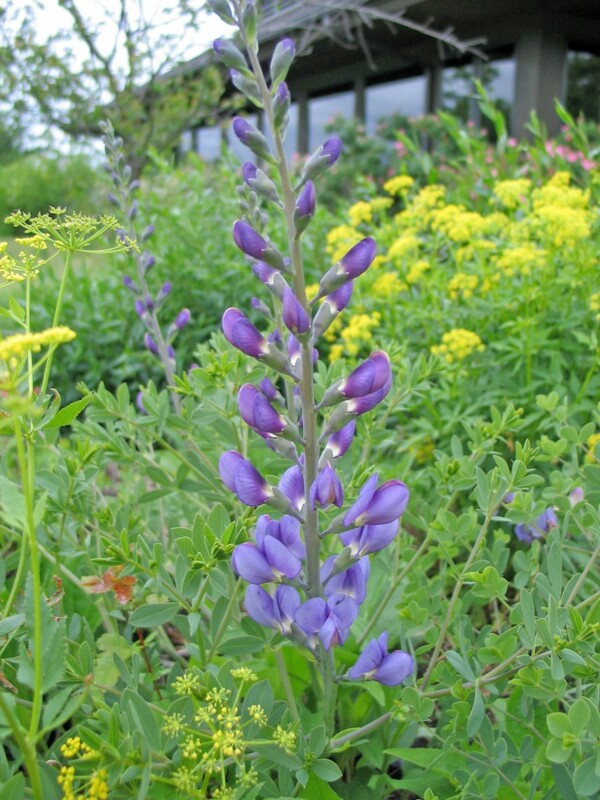 Blue false indigo with golden alexanders in the background. Butterfly milkweed and Echinacea flowering in a wildly-planted arrangement. 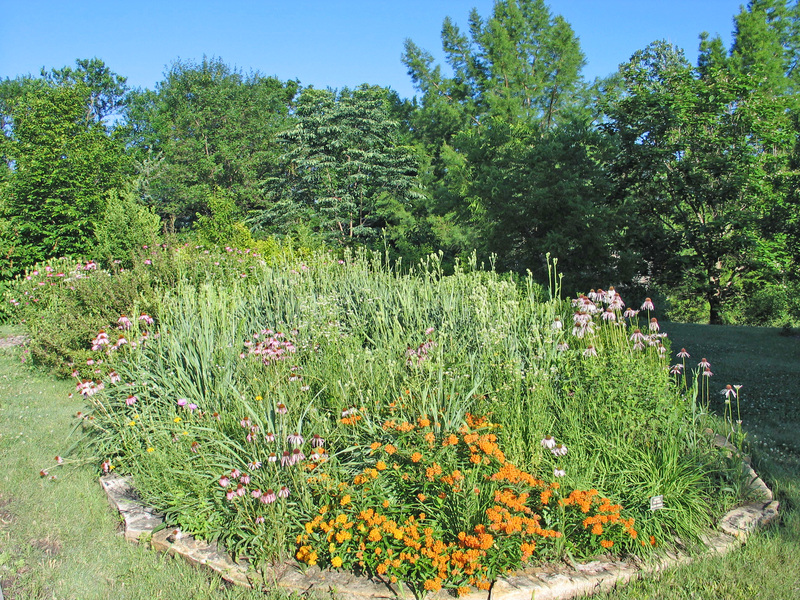 Your prairie garden planting strategy could go in a couple of different directions: 1) a high diversity, wild prairie look with a few plants of each of these species, or 2) a more focused horticultural look with say only a half a dozen of these species planted in higher frequency and purposeful clumps or patterns. As an ecologist, I historically leaned toward the former. But I also appreciate that our human landscaping sensibilities crave order, and thus find myself more each year leaning toward the latter when advising plantings. There are many other fascinating features of these plants, including wildlife species specificity, cool pollination mechanisms, herbal/medicinal values, attractive textures/seed heads, and interesting cultural and natural history connections. 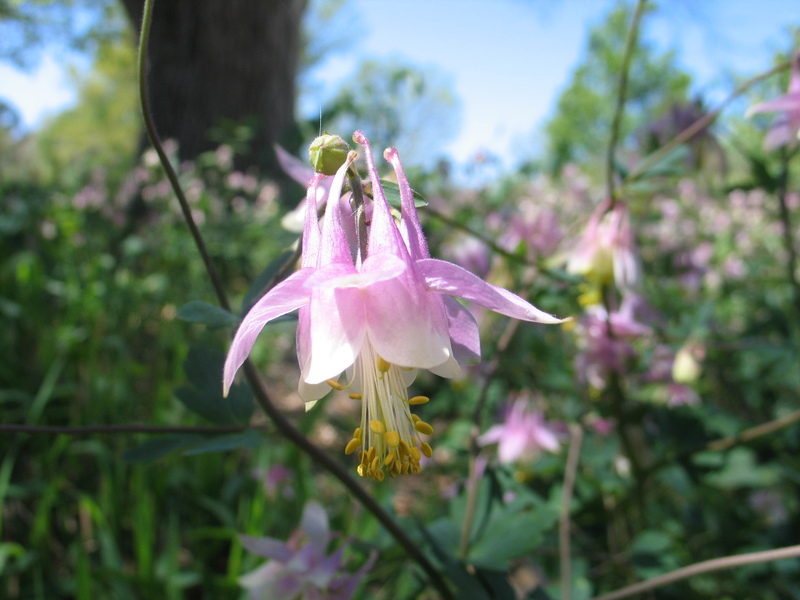 Whatever your planting strategy you implement with your next garden, just know that selecting from these species will provide you a great start to a lifetime of rewarding and educational native gardening experiences. Ohio spiderwort, New Jersey tea, rose verbena, and marsh milkweed.